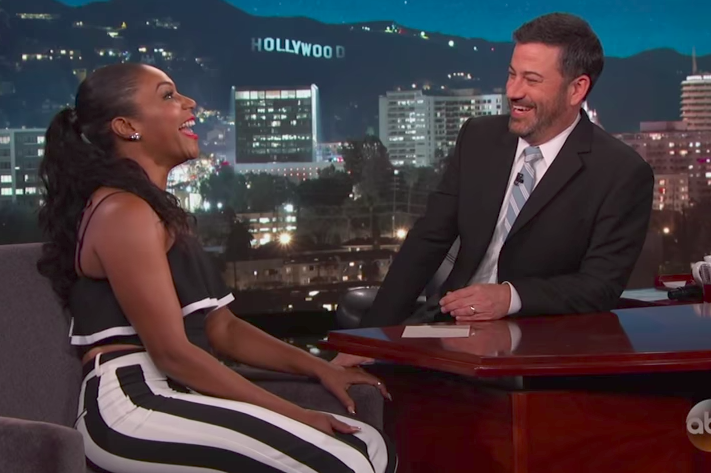 Tiffany Haddish appeared on "Jimmy Kimmel Live!" on Wednesday night. Take "Girls Trip" star Tiffany Haddish and add marijuana, Groupon, Jada Pinkett Smith, Will Smith and boat full of fans in a New Orleans swamp – now that's quite the story. Haddish appeared on "Jimmy Kimmel Live!" Wednesday night where she launched into a 7-minute long tale about her hangout with Pinkett Smith, co-star in the new comedy out Friday, and her husband, West Philly's own Will Smith. To hear Haddish tell it, Pinkett Smith told Haddish that she and husband Will Smith might tag along on a Groupon swamp tour. Haddish didn't think the two would follow through, so she smoked "a whole bunch of weed because the doctor told [her] to" in preparation for the sightseeing session, only to get a call from Pinkett Smith that the pair would indeed be joining. Haddish then jumped in her $20-a-day rental car and went to pick up the two superstars where she expected she would jump in a more secure car that would protect her new famous friends. She instead drove Jada Pinkett and Will Smith in her rental. "All I could think to myself was 'Tiffany, you need to be as careful as possible,'" she told Kimmel. "'You don't wanna be the b**** on TMZ who killed the 'Fresh Prince of Bel-Air.' That's $280 million in the backseat of a $20-a-day rental." The three pulled up to the swamp tour and, Haddish said, Pinkett Smith admitted she had no idea what Groupon was and therefore confused why there were so many people gathered waiting for the boat. She was under the assumption that the swamp tour would be private. Haddish said that as expected, people rushed up to Jada Pinkett Smith and Will Smith. "Will sits down and this really drunk guy comes on and goes, 'Hey Will, what part of Philadelphia are you from?" Haddish said. "He goes, 'West Philadelphia.' He goes, 'Ah ha! Born and raised!'" Will Smith told all the people approaching him for photos and autographs that they would oblige them after the tour, an announcement met with cheers and applause. He then leaned in to Haddish during the tour to talk. "He was like, 'Hey, Tiffany. I'm going to have to get me one of these.' I was like, 'What? One of these ferry boats?' He's like, 'Nah, nah, a swamp.' I was like, 'You're going to buy a whole ecosystem?'" Pinkett Smith recently appeared on "The Tonight Show Starring Jimmy Fallon" where she recounted a much briefer version of the tale, and said they had "the best time ever" despite her lack of Groupon knowledge. "Girls Trip," is a comedy about four friends looking to rekindle their friendship as they travel to New Orleans for an annual festival, starring Pinkett Smith and Haddish along with Regina Hall and Queen Latifah.